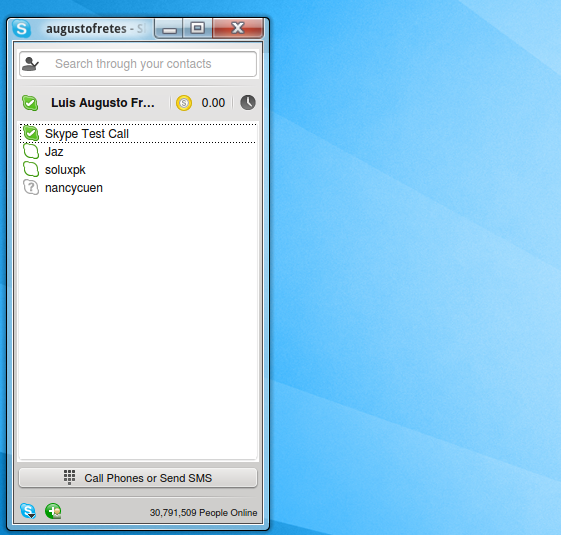 The most popular VoIP service has release a new version of their Linux application. Finally achieving parity with the Skype apps on Windows and Mac OS X.
Skype was recently bought by Microsoft and this beta has been in the labs for so long I can’t remember. So this release may serve to calm fires regarding whether it will keep supporting Linux. In fact, Skype’s support just gets wider and wider, ironically though, the worst of all its apps is the one for Windows Phone 7. New in this release, codenamed Four Rooms for Improvement, are the new call interface (which is shared among all versions now, including their mobile apps), and an improved unified conversation view where users can easily track all their conversation. Video and sound quality are also improved. Is it easy to install? While Skype doesn’t offer an official repository (it’s part of Canonical’s partner repository, but 4.0 hasn’t hit the repository, and I doubt it will happen any time soon), you can download it easily straight from its official site, just select the deb file, double click it, and hit install.